Diamond Ranch 57, El Camino 54 — Roman Silva scored 19 points and had 10 rebounds and Ryan Haywood added 15 points and had eight rebounds for the Panthers (17-6, 6-0) in a first-round Real Run LA game shootout. Duarte 46, Rio Mesa 32 — Ryley Thompson scored 17 points and MacKenzie Barnes added 14 points for the Falcons (20-3, 6-0) in a nonleague game. St. Lucy’s 11, La Serna 7; Ayala 17, St. Lucy’s 8 — Sienna Jagielski scored five goals, Devin Holcomb scored four goals and had six steals and goalie Ana Benson had eight saves for the Regents in a Bonita Tournament quarterfinals win. Jagielski had six goals and Clare Rowland scored twice to lead the Regents (15-9, 4-2) to place third at the tournament. Edgewood 44, La Puente 41 — Daniel Felix scored the game-winning basket and finished with 11 points to lead the Lions (8-14, 2-5) to the Miramonte League victory. Ozzy Mancilla scored 12 points and Michael Martinez added eight points and had 21 rebounds for Edgewood. 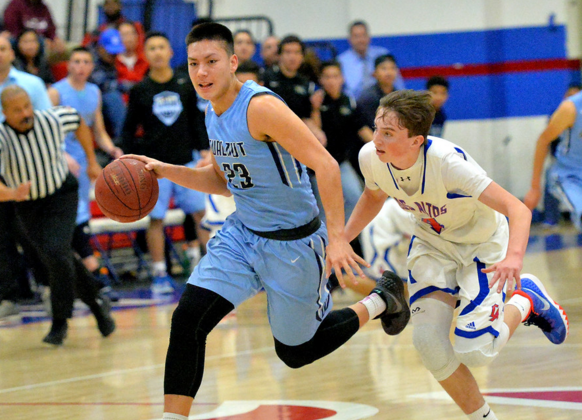 Northview 68, Rowland 65 — Curtis Hong scored 25 points, Jonathan Hu had 22 points and five rebounds and Anthony Lehr added 10 points and had six rebounds for the Raiders (10-12, 3-3) in a Valle Vista League game. Rowland 55, Northview 13 — Tianna Eaton had 21 points, six rebounds, five steals, two assists and two blocks for the Raiders (18-2, 6-0) in a Valle Vista League game. This is the best start for Rowland since 1988. Walnut 75, Los Altos 71, OT — The two-time Hacienda League defending champions stayed in the hunt for a third consecutive title as the Walnut High School boys basketball team defeated Los Altos in 75-71 in overtime to move into a tie for second place in the league thanks to a 37-point effort from Dwight Ramos. Bishop Amat 43, St. Anthony 42 — Bishop Amat played right into the thick of the Camino Real League race as it started the second round of league play with a 43-42 win over first-place St. Anthony on Friday night.The Lancers (18-4, 4-2), the Tribune’s sixth ranked team, moved to within one game of first place after handing the Saints their first league loss of the season. South El Monte 61, El Monte 48 — Chris Salcedo had 29 points and Alex Hernandez added 12 points and had 10 rebounds for the Eagles (9-10, 5-2) in a Mission Valley League game. Edward Dominguez scored 13 points and Jordan Ayala added 12 points for El Monte (10-13, 1-6). San Dimas 64, Wilson 59 — Ronny Rafeh scored 16 points and had six rebounds, Andrew Sanchez added 11 points and Donnell Leffridge had nine points, seven assists and four rebounds for the Saints (16-6, 6-0) in a Valle Vista League game. This was the Saints ninth-straight win. Jared Kawamoto had 21 points for Wilson (11-11, 4-2). Diamond Ranch 81, West Covina 64 — Roman Silva had 26 points, 10 rebounds and four blocks, and Giraun Benjamin added 24 points to lead the Panthers (16-6, 6-0) to the Hacienda League win. This was Diamond Ranch’s 10th-straight win. Tyler McLean had 13 assists for the Panthers. Diamond Bar 45, Ayala 33 — Candace Black scored 15 points and had six rebounds, Juliana Gamboa added 14 points and had nine rebounds and Destinee Garr had 12 rebounds for the Brahmas (20-2, 6-0) in a Palomares League contest. Bassett 49, Garey 20 — Kailey Gutierrez had 18 points and Kassandra Aguilar added 15 points to lead the Olympians (12-3, 7-0) to the Miramonte League victory. Rancho Cucamonga 52, St. Lucy’s 47 — Danielle Tostado scored 23 points for the Regents (14-7, 1-5) in a Baseline League loss. Sierra Vista 2, Baldwin Park 0 — Zitlali Jimenez and Samantha Loza both scored a goal and Maria Hernandez had an assist for the Dons (17-2-1, 6-0) in a Montview League match. Monrovia 7, Blair 0 — Alana Elliott and Savanna Pfau both scored twice for the Wildcats (11-5-3, 4-1-1) in a Rio Hondo League game. Michelle Palfrey, Aisling O’Beirne and Kate Ogilvie each scored a goal for Monrovia. St. Lucy’s 14, Glendora 7; St. Lucy’s 14, Charter Oak 7 — Sabrina Garabet scored six goals and Devin Holcomb had five goals for the Regents in their first-round Bonita Water Polo Tournament win of the day. Garabet scored six goals and had three assists, Sienna Jagielske had three goals and Clare Rowland scored twice to lead the Regents (14-7, 4-2) to their second-round win against Charter Oak. 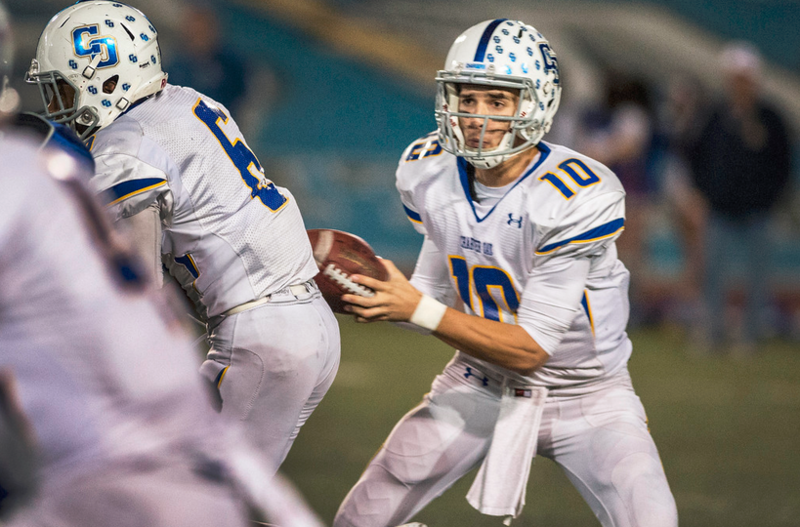 Click the thread to view rosters for Saturday’s East-West Hall of Fame all-star football game at West Covina High School at 6 p.m.
Game Preview: It may have been a year ago, but the West team’s resounding 31-14 win to halt the East seven-game win streak in the Hall of Fame All-Star Game for high school football seniors has not been forgotten. Especially by the East. The Hall of Fame Game rarely feels like “just an all-star game” and it doesn’t figure on Saturday night when East meets West in the game’s 37th renewal at West Covina High. Kickoff is 6 p.m.
Should coach have been fired? South Torrance High football coach Josh Waybright, whose 18 years of coaching the Spartans (13 as head coach) was highlighted by a CIF Southern Section Northwest Division championship game appearance in 2010, will not be retained as football coach. Waybright, who confirmed the news to the Daily Breeze on Thursday, said the main reason given for his dismissal was his use of smokeless tobacco. Garey 1, Bassett 0, 2OT — Margarita Gomez scored a goal with an assist from Veronica Alvarez to lead the Vikings (9-5-3, 7-0) to the Miramonte League win. Rowland 6, Northview 1 — Melanie Romero scored twice for the Raiders (13-7, 5-1) in a Valle Vista League match. Ruby Fernandez, Daniella Perez, Cecilia Swain and Allison Silaphet each scored a goal for Rowland. South Hills 1, Diamond Bar 0 — Hailey Zerbel scored a goal with an assist from Amber Marinero for the Huskies (15-1-5, 7-0) in a Palomares League game. San Dimas 4, Wilson 2 — Cheyenne Cepeda scored twice and Taylor Bacman and Ryan Craig each scored a goal for the Saints (8-8-2, 5-1) in a Valle Vista League game. Bonita 10, Glendora 4 — Amanda Legaspi scored four goals and had an assist, Kayla DeHerrera added three goals and goalie Emily Zerpoli had four saves for the Bearcats (12-5, 5-1) in a Palomares League game. Chino 12, Charter Oak 8 — Maddie Meza and Madi Dromgoole both scored five goals for the Cowboys (4-3 overall) in a Hacienda League game. Sarah Adams scored six goals for Charter Oak. Duarte 52, Baldwin Park 27 — MacKenzie Barnes had 14 points, 10 rebounds and six assists to lead the Falcons (18-3, 5-0) to the Montview League victory. Walnut 67, Chino 60 — Dwight Ramos scored 30 points for the Mustangs (18-4, 3-2) in a Hacienda League contest. Adam Saavedra had 16 points and Elias Richo-Lankenau added 21 points for Chino.